On sunny days, parks and gardens are one of the most beautiful places to visit in Melbourne. .......There's all these things and lots more in the places I've listed below. ........so I've only included my favourites here, especially the ones with interesting/fun free activities to do. Fitzroy Gardens - my favourite favourite Gardens in Melbourne. Loads of free things to see and do here. 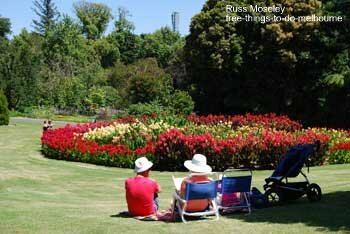 Royal Botanic Gardens - another fabulous Gardens with free activities to do. Pioneer Womens Memorial Garden - An oasis of calm. Birrarung Marr - A kids playground, aboriginal artworks and the Federation Bells. 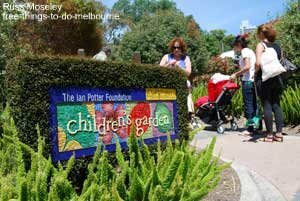 Ian Potter Foundation Childrens Garden - A wonderful garden for children, truly unique. Albert Park - A pleasant flat five kilometre walk around a lake close to Melbourne CBD. 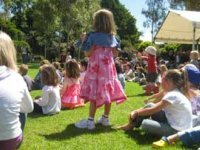 Australian Garden - Also known as the Royal Botanic Gardens Cranbourne, there's lots to see and do here, with or without the kids. This one is a long way out the city though. Werribee Park - This is also out of the city but well worthwhile checking out if you have a car - especially the Victoria State Rose Garden section.